4th Annual RVA Beauty & Barber Awards Hair & Fashion Show | ComeSeeTv Broadcast Network ... Can you See me Now! Nubian Entertainment & DVL Enterprises is hosting its 4th Annual RVA Beauty & Barber Awards Hair & Fashion Show at the Four Points by Sheraton 4700 South Laburnum Avenue, Richmond, VA 23231, Sunday June 7th, 2015 at 6 PM. 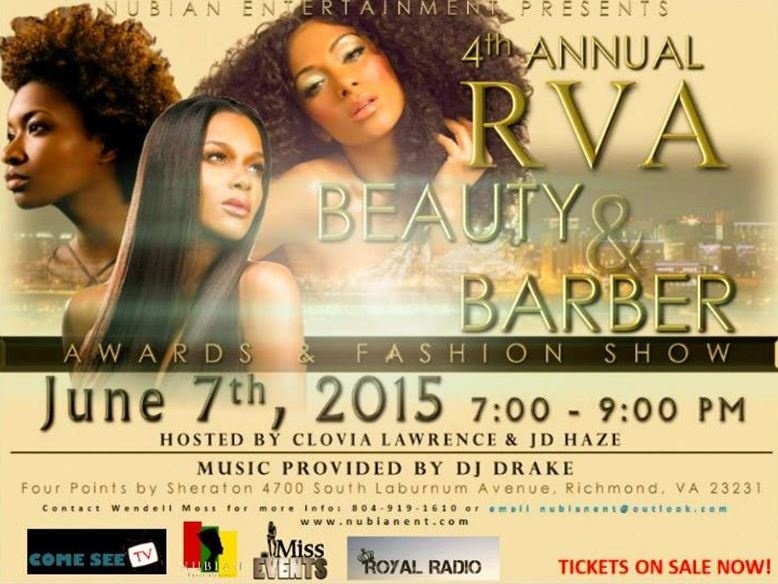 Nubian Entertainment & DVL Enterprises is hosting its 4th Annual RVA Beauty & Barber Awards Hair & Fashion Show at the Four Points by Sheraton 4700 South Laburnum Avenue, Richmond, VA 23231, Sunday June 7th, 2015 at 6 PM. This year’s event will be presenting some of the top salons and barber shops in Richmond and surrounding counties with awards and recognition for their services. The show will also feature a fashion show with some of VA’s hottest designers, stylist & models to walk the runway. Winners will be selected by votes from the public and given a comprehensive prize pack which includes cash and promotions. The goal of these events is to bring together vendors, presenters, entrepreneurs & those in the entertainment field to present to the public their services or goods in a non-conventional but entertainment filled platform. By highlighting the area’s top talents in hair and beauty our ultimate goal is to create educational scholarship funds for local high school students.